If you visit Arches or Canyonlands National Parks in the summer, you may be greeted by long days with temperatures in the triple digits. In those conditions, a simply swim in a cold creek can be as satisfying as any of those parks’ amazing landmarks. 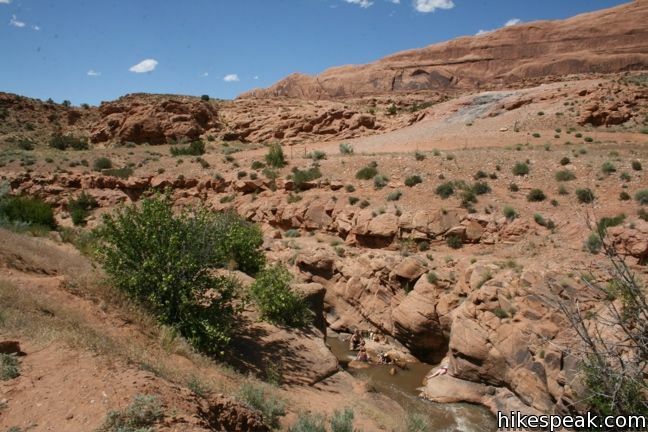 The Colorado River around Moab is swift and silty, so instead bathe in the refreshing waters of Mill Creek. 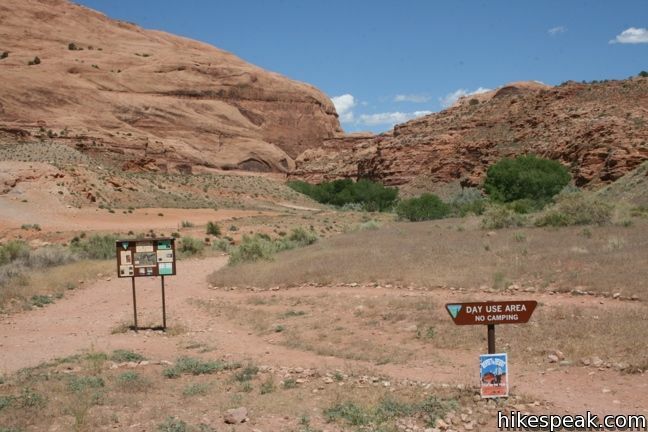 Mill Creek Trail heads deep into the Utah landscape southeast of Moab, but you only need to hike a quarter-mile to reach this fluvial refuge. Take the single track from the parking lot and head east parallel to Mill Creek, which has dug a fifteen-foot deep trench into the rocky plain. The level trail passes just to the right of a man-made waterfall at an old mill site. From here, the trail continues up along the creek, but if all you want is a refreshing dip, backtrack along the ledge for a few hundred feet until a path appears down the rocky bank. Once you descend to the creek, the hiking is over and it’s time to swim. Mill Creek is shallow with relaxing pools and enough current to push you down a few rock water slides. Make your way upstream and you may see a few daredevils cliff jumping into the pool at the base of the falls. The deep spot is quite narrow, so jumping is not the greatest idea (unless you know a good doctor in Moab for broken legs). 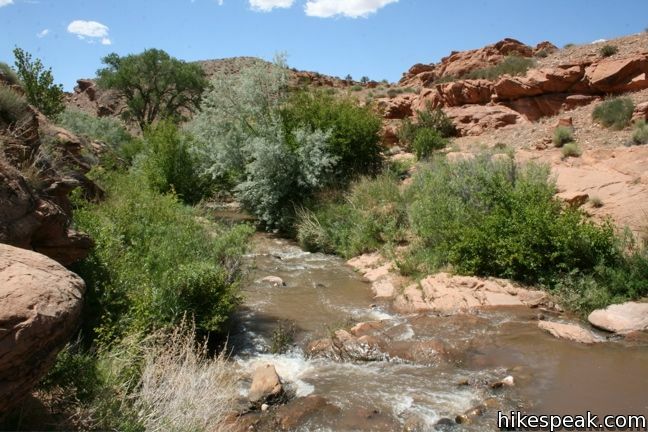 Mill Creek is a great way to beat the relentless summer heat that comes with hiking in Utah. When you are ready to return to the 100-degree air, make a 180-degree turn, ascend the bank of the creek, and walk back to the parking lot. 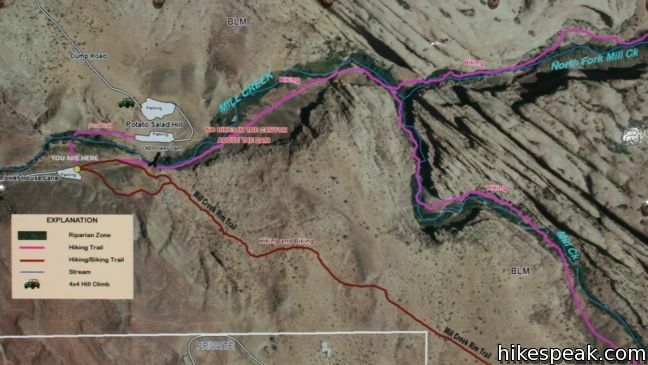 Mill Creek is located on BLM land. Dogs are allowed. No fee or permit is required to visit Mill Creek, so get out and enjoy. Mill Creek Popularity: Mill Creek has become a highly (or overly) visited destination in the past decade. Trash, graffiti and other environmental impacts to the park and surrounding properties have increased as a result. New restrictions are enforced along Powerhouse Lane to address overflow parking and curtail visitors (parking may not be available when you arrive to hike). Take efforts to reduce the impact of your visit and help remove trash. 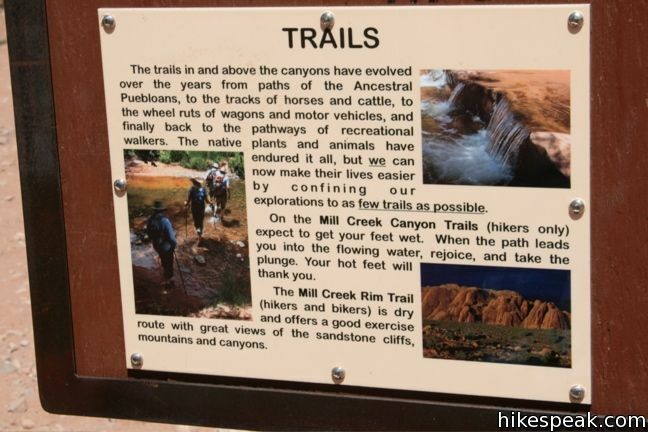 Read more about visitor impacts in the Moab Sun News or help restore the area with Mill Creek Partnership. To get to the trailhead: From downtown Moab, head south on Route 191. Make a left onto Sage Ave, followed by a quick right onto Holyoak Lane. Drive two blocks to Mill Creek Drive and make a left. Drive half a mile to Powerhouse Lane and turn right. Take this road for a third of a mile to the parking lot at road’s end. Park in the public lot and not where prohibited along Powerhouse Lane or on private property. Explore other hikes in Zion, Canyonlands, and Arches National Parks. This short stroll in the Sierra foothills visits the perfect swimming hole for a hot summer day. 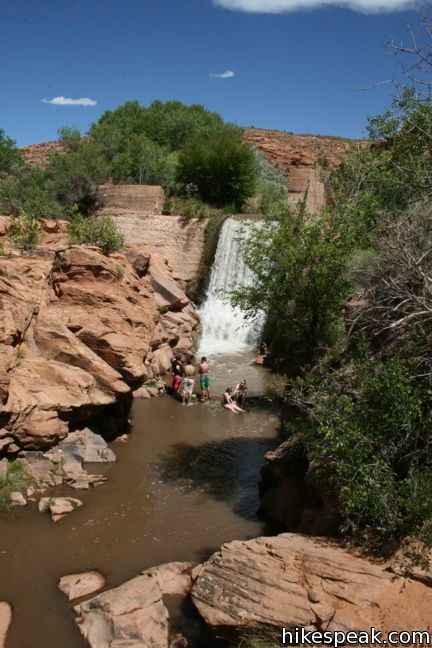 This 1.5-mile hike visits a refreshing natural water slide on the eastern side of the Great Western Divide. There are 25 campgrounds operated by the Bureau of Land Management surrounding Moab, Utah outside Arches and Canyonlands National Park. If I remember correctly we went left. We had the same issue. Not sure where to go, but we kept following people’s voices, and eventually wound up at the falls where you can cliff jump. 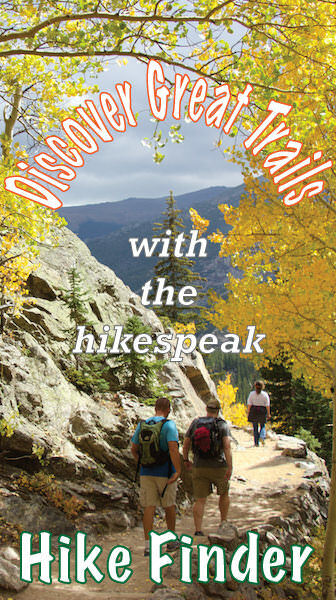 This is a really cool hike. My friend and I did this hike in July, during the heat of the day and it was amazing. You get to wade through the cool water which helps keep you from burning up. There are a lot of neat little places to explore. I had the courage to climb the falls and jump off the cliff into the pool. About 20′-30′ depending on where you jump from. The pool is only about 6′-7′ at its deepest so perfect execution is a must. There is soft mud at the base of the falls which helps absorb the impact. I jumped off twice, and the second time I felt my leg slide against a hidden rock that scared me pretty good. It was fun, but definitely not safe for your beginning cliff jumper. I would ask locals for advice before attempting this cliff! Today (10-1-16) lost a backup in the parking lot of this trail. Anyone know where (website) I make a post to ask for help if someone found it? For years, the community has tried to keep “Left Hand” from becoming known to so many tourists, due to the environmental impact. Perhaps just keeping it to themselves would be a slightly more appropriate way to say that… I put it to the test many years ago and asked an agent behind the counter at the visitors center… She shook her head and said: “I have never heard of Left Hand”! Perhaps she was new. Either way, it is a wonderful oasis and a short hike! This place has become gross. I highly recommend skipping the area.